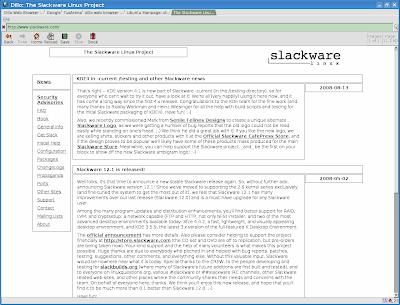 Dillo, the famous little browser used in small, lightweight distributions like Damn Small Linux (DSL), reached version 2.0 on October 14, 2008. 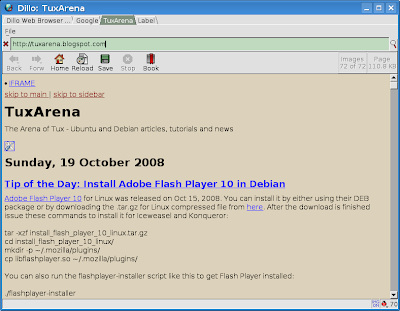 The last stable Dillo release was 0.8.6, which was around for over two years (April 26, 2006), and this new version brings tons of new improvements, changes and features, the biggest of them being tabbed browsing. Yes, Dillo allows now browsing using tabs, which is a must-have functionality for any desktop browser, no matter how small it is. The changelog is huge. This release is also the first one written in FLTK, as the application was ported from GTK. Dillo is written in C and C++ and it's built using the free FLTK, the Fast Light Toolkit, which provides a lightweight GUI toolkit for building graphical applications. The official website provides DEB packages for both Ubuntu and Debian, together with RPMs for Fedora and Red Hat. The source is also available, but you will need FLTK2 if you want to compile it from source. I like the clean, simple interface provided by this lightweight browser. Dillo is a great piece of software which can be used successfully in any of the not-so-bloated distributions, like Damn Small Linux. As I already mentioned, the major feature of this release is tabbed browsing. I liked that Dillo uses the usual shortcuts for using it, like Ctrl + L for the address bar or Ctrl + T for opening a new tab. Don't expect full compatibility with Firefox shortcuts though. For closing tabs use the Ctrl + Q shortcut, or use the File -> Close menu option, although I think tabs really lack a button for closing them (and there's no reason for it not to be in there), doing it on the keyboard is slow when using it with a mouse. When you right-click on a link, a popup menu appears and the 'Open Link in New Tab' option is just under the mouse pointer. Considering that usually, when you right-click on a link you will want to open it in a new tab (or save link as...), this feature is pretty smart and fast compared to browsers where you have to move the mouse over this option. Maybe the brown background is not the best choice for a background, but it can be changed in the Dillo configuration file, ~/.dillo/dillorc. You'll have to create this file using a text editor, and an example file is provided on the official website, here. To change the background colour for example, use bg_color=white (or the colour you desire; you may also use hex codes). Dillo uses a custom rendering engine, not based on Gecko, and it displays pretty well almost any website, at least enough to understand it, and it supports images too. However I could not get Dillo to load certain web pages, and I'm not very sure why that is. For example, a page which I created with my basic HTML knowledge is not loaded in Dillo, while another one works flawlessly. They both contain only tables. 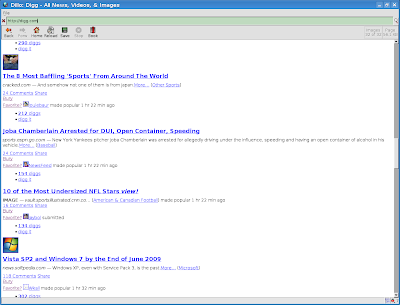 Anyway, Dillo works very well on sites like Digg.com or Slashdot.org. It does not support Flash, at least not yet, but it's not even the scope of this browser to support it. Searching for text is done in a similar way with Firefox: the search box appears at the bottom of the web page, without opening a new window, and you can search for next occurance of the text in the web page by pressing Enter. Testing the new 2.0 release was a real pleasure, and I was positively impressed by this browser, although I used it only occasionally before. A wonderful release and, I hope, a new base for developing new features and (eventually) improving functionality. I've been using Dillo for quick-lookups for long. Also, seen/used the hacked togeder tabbed version of Dillo 1.0. Nevertheless, lately I've been using Midori. Just "en passant", I suppose people know the right way to open a link in a new tab is by clicking the third (middle) button (on wheel mouses, just press the wheel down) in Firefox. Even Window users should know this by now... I'm very fond of Dillo and I hope it works this way, too. IMHO, we all should be using FLTK by now. this is sad and ridiculous. A fine example of a bad development model. I recall around mid 2003 that this feature was added by Frank de Lange and was blamantly rejected by the core developers. We're talking for something that already happened about 5 years ago. this is at least ironic.